The inverse images of the side lines of a triangle in its incircle are three circles of equal radii that concur at the incenter. The circle through their second points of intersection is none other than the inverse image of the circumcircle. It has the same radius. R. Honsberger credits Arnold Emch (1916) with the following observation. For a given $\Delta ABC,$ we are interested in the inversion in its incircle. The side lines (being tangent to the incircle) invert into the circles that pass through the incenter $I$ and still tangent to the side lines at the same points $A',$ $B',$ $C'$ of tangency, as the side lines. These circles have $IA',$ $IB',\;$ and $IC'$ as their diameters. The three are therefore equal. 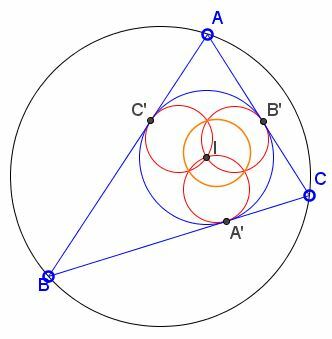 Under inversion in the incircle of a triangle, the side lines and the circumcircle are carried into four equal circles with the common diameter equal to the inradius of $\Delta ABC.